Art dealers, tribal members, collectors, legislators, appraisers and auctioneers filled a Santa Fe hotel ballroom to capacity and beyond to attend the May 22, 2017 symposium: “Understanding Cultural Property: A Path to Healing Through Communication.” The full day symposium, sponsored by ATADA, a professional trade group, and Santa Fe’s School for Advanced Research, centered around issues pertaining to sacred and ceremonially significant objects held in private collections or by dealers. Since 1990, the US Native American Graves Protection and Repatriation Act has required all federally funded institutions, including museums, to inventory and return scared, communally-owned, and funerary associated and unassociated items to tribes. However, a legal trade in Indian artifacts has been countenanced and even encouraged by the government since the 1880s, leaving millions of objects, including a small number of sacred objects, in private hands. The market’s challenge is to find a means of bringing these key sacred objects back to tribes, without damaging the art market that supports dealers in both antique and contemporary fields and is a primary source of income to Native American artisans, especially in the Southwest. The primary goals were to increase understanding of tribal perspectives among the dealer and collector communities and to explore alternative proposals for returning key ceremonial objects to the tribes. One proposal was legislative; speakers examined the legal details and economic ramifications of the Safeguard Tribal Objects of Patrimony Act of 2016 (STOP Act) which is expected to be reintroduced soon. The other was to explain and promote the ATADA Voluntary Returns program, which in the last few months has returned several dozen sacred and ceremonial objects to Navajo, Hopi, Zuni, and other Southwestern tribes. The overall tone of the day was a spirit of cooperation and collaborative beginning, especially in regard to supporting the identification and return of items of ceremonial and religious significance. The audience was responsive, attentive, and aware of the issues; post-symposium emails from audience members raised additional questions, but also stressed how much had been learned from the panelists, especially from tribal representatives Tim Begay, Arlen Quetawki, and Sam Tenakhongva. The symposium began with remarks from ATADA’s Vice President Kim Martindale and School for Advanced Research’s (SAR) Brian Vallo. Mr. Vallo is from Acoma Pueblo. He noted that auction houses operate globally, and in a transparent matter, with both online and printed catalogs. Anyone can sign up to get email notifications with links to catalogs. Cowan encouraged tribal member interested in tracking sales of Native American objects to register to receive email notices. He said that just four auction houses – Bonham’s, Cowans, Heritage and Skinner’s – deal regularly with the more valuable types of American Indian art, Sotheby’s and Christies having for the most part abandoned the Indian art market. Each of the four auction houses hold two major auctions a year, and each sells about 350-400 objects in an auction. Thus, about 2800-4000 Indian items are sold per year through the major auctions. There are also hundreds of smaller auction houses that sell one or two Indian items at a time in mixed auctions. These smaller sales amount to a few thousand items per year. None of this counts the most recent and strictly commercial types of Indian art – for example, a quick eBay search for “Zuni jewelry” turned up 15,000 items. Auction houses didn’t begin to sell Indian art in quantity until the 1970s. The business expanded exponentially through the 80s, but is declining. Cowan said that he now is expecting to receive an “avalanche” of Indian art that will be “coughed up” by baby boomers. Only a tiny fraction of these objects are considered sensitive materials for the tribes. If an auction house takes an item on consignment, and there is a complaint from a tribe which says it has better title than the consignor, then the auction house can withdraw the item from sale, but they cannot give the item back to anyone but the consignor. An auction house has little in incentive to try to sell an item that will be subject to a claim, and even when an item is unquestionably legal to sell, if a claim is made, the auction house is very likely to withdraw it. Cowan expressed concern that creating a new law will have unintended consequences as in the case of the American trade ban on the import and export of ivory. This ban has created issues with customs as well as virtually destroying the American trade in legitimate ivory art, due to confusion over what is and isn’t covered under the ban. Vanessa Elmore emphasized her optimism about the group’s ability to find common ground to build an ethical and sustainable Native American art market. She cited the greatest challenge as the reconciliation of seemingly disparate issues between Native American communities, museums, collectors, and the art market, and emphasized a collaborative approach that would make it clear within the market that there were “inalienable tribal objects” whose trade could and should be ended. As a participant in the Voluntary Returns program, she felt self-regulation was workable and preferable to government regulation. She later defined self-regulation as establishing and enforcing industry standards, applying codes of ethics, and building consumer confidence while educating the public. Kim Martindale discussed his experience participating in and producing art shows for the last 40 years. He emphasized that as the marketplace has changed, the shows have reached out and been more inclusive, engaging in dialogue with SWAIA (the Southwestern Association for Indian Arts) which sponsors the Santa Fe Indian Market, the Autry Museum of the American West (which sponsors a big November show in California), and other major markets to collectively encourage the sale of Native American artworks. He said that some of his incentive is economic (his retirement is in his collection) but that his involvement went beyond economics; he had been deeply inspired by native art and culture his whole life and he was “looking forward to hearing about the objects that are crucial to the Native American communities, that inspire those communities, that are essential for those communities,” and engaging in dialogue to share mutual concerns. Brian Vallo conveyed his early experiences with NAGPRA and cultural preservation and continued by discussing his role at SAR. He said that he was interested in learning more from the tribes about how best to manage and store collections at SAR, as there was now greater willingness among the tribes to engage in conversations leading to more traditional care of the objects in their collection. Through these experiences the tribes are approaching NAGPRA conversations about the stewardship of artifacts by institutions in a different way than they were just 10 years ago. He expressed hope that the symposium would result in a better understanding of the issues. The second session “Tribal Perspectives: Contemporary Concerns” brought together Tim Begay of the Navajo Historic Preservation Department, Navajo Nation, Arlen Quetawki a religious leader, former governor, and police officer from Zuni Pueblo, and Sam Tenakhongva, who is a religious leader from the Hopi Pueblos, and who had traveled extensively to communicate the Hopi perspective to museums and collectors in France, in response to the Paris auctions. Each of the tribal representatives spoke directly to the audience, and with great eloquence, answering a series of questions posed by Brian Vallo. Questions ranged from, “What is your tribe doing to address the continuous removal of material culture and specifically sacred and ceremonial objects?” to “Why did they leave in the first place?” to “Who is the expert? Collectors and museums or the tribes?” and to the tribes’ reasoning for supporting the STOP Act. Each of the panelists said that there was collective responsibility for the removal of objects from tribal hands. The panelists also talked about how tribes, dealers, and collectors all needed to change their perceptions of the problem and alter their actions in order to make sure that items no longer left the tribal community. Sam Tenakhongva explained that he came to the panel from First Mesa. He provides leadership and advice for the village of Walpi on religious matters. Mr. Tenakhongva explained that he was a schoolteacher, teaching standard curricula and also inculcating an understanding of proper social relationships and behavior to the children of Hopi. His examples from the school were much appreciated as bearing also on the larger issues of relationships between different cultures. He noted that for the Hopi, addressing the continuous removal of material culture was the biggest question they were facing as a tribe. Mr. Tenakhongva said that he was aware of who in the tribe was responsible for removing items. He also said that he personally felt responsible for items leaving, because he was responsible for educating members of the tribe so they cared properly for the items. 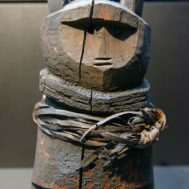 Sacred items had left tribal control through three main avenues – removed by individuals within the tribe who knew they were doing wrong but had lost their way, often through use of drugs and alcohol, by collectors who contacted tribal members directly and pressured them to sell, and through contacts with museums that had taken place over the last 100 to 150 years, as researchers and collectors from museums were sent to collect items from all the tribal cultural and religious societies. Mr. Tenakhongva said that there were not written rules governing the responsibility for artifacts, but there was an unwritten understanding that certain individuals have rights and responsibilities for being a caretaker of both privileged information and scared objects. This caretaker role did not give the individuals or families the right to sell objects; the ownership of these objects still rested with the tribal commnunity. Not all individuals honor or understand those responsibilities; he had gone to France to try to make the Hopi position clear to the French courts, but the courts had objected that there was no written law establishing ownership. 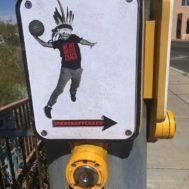 Therefore, two years ago, he had asked the Hopi tribal council to start putting some of the information about these objects into legal language in a way that didn’t infringe on the privileged and secret nature of information about the scared objects. He felt that the STOP Act would encourage people to understand that they should not be taking such objects: items of high cultural value are communal property; everyone has responsibility for such objects. He understood that auction houses are contractually obligated to their consignors not to reveal information, but hoped that the auctions would work with the Hopi to try and secure returns. He noted that an object’s collection history is important: an object returned from a museum may have been treated with toxic chemicals, which is potentially a danger to anyone handling it. An object that is returned by an individual collector is less likely to have been treated, but this is important information for the tribe to know. Mr. Tenakhonva also said that when an item is returned, the tribe is often able to identify the person or family from which it came, and therefore better able to address the causes for which it left, and to keep a watchful eye over the persons who have responsibility for the object. Mr. Tenakhongva said that since the publicity that took place with the Paris auction sales, there have been a number of items returned voluntarily, sometimes with items showing up at the tribal offices, as people holding them have become more aware. The next step Hopi will need to work on is how best to deal with voluntary returns. He stressed that it was impossible for a Hopi tribal member like himself to ever put a valuation on returned items [for donation] but that there were pathways to explore to resolve those kinds of documentation issues to further returns. Arlen Quetawki of Zuni Pueblo said that he has worked for years as a tribal officer, particularly in dealing with police issues involving abuse of women. He has also been a tribal governor, and has been a religious leader and caretaker for his kiva for 41 years. He said that one reason for the continuing problems of the tribes in locating objects that have left the community is the lack of communication between the tribes and art dealers. He suggested that there be meetings [like the symposium] both nationally and internationally so that people outside the tribes would better understand both the practical factors involved and the less-understood consequences for persons who had sacred objects who were not supposed to possess them. These unintended consequences could include drawing harm to themselves, their families, and the world in general. He noted that there were more than 500 tribes and that there will not be understanding unless there are real conversations between collectors and dealers and all of the tribes. Mr. Quetawki described his personal experience with desecration of archaeological sites and actions disturbing human remains. He noted the impact of drugs and substance abuse in relation to items leaving the tribe; despite the remoteness of Zuni, he said there are serious problems with drugs and alcohol. He told the audience that tribal individuals “know the consequences but someone is encouraging them to sell.” He said that in 2013, the Zuni council had taken the unprecedented step of amending their constitution to restrict the sale of any religious or ceremonial item by any tribal members. The Zuni voted for that amendment. This non-traditional approach was needed in order to emphasize the seriousness of removing such items, noting that under US law, the traditional Zuni punishments for violating the trust of the community by removing sacred objects were so severe that they would not be lawful. He strongly urged working together with collectors and art dealers in order to create a win-win situation. Tim Begay, who is the chief Cultural Preservation Officer for the Navajo Nation, said every community is faced with the loss of artifacts and religious items. He talked about growing up with numerous members of his family being singers and healers, and being familiar with what items were actually used for ceremonial. He said that only those people involved in religious activities would truly know and understand the items used, but he recognized that a collaboration with people outside the tribe was needed to bring them back. The entire panel discussed in general terms the ceremonial, communal and healing significance of sacred items. Tim Begay perhaps best summed up the tribes’ relationship with ceremonial objects by saying; “These objects are given life when they are made because those objects are to heal people, to keep community… For native people these objects give us hope and that hope extends from the past to the present to the future because these objects are the identity of who we are and how we exist on mother earth.” Others on the panel also emphasized the role that the return of ceremonial objects plays in the healing of community. The panelists expressed concerns about divulging sensitive information regarding ceremonial uses of objects in the process of facilitating repatriation. Some felt that NAGPRA put the burden of proof on the tribes to substantiate their claims. In some cases, the revealing of the information that is required to make a claim can lead to severe penalties for the tribal member. The tribal representatives all saw the STOP Act as a tool to bring religious artifacts home from overseas, but also supported the voluntary returns undertaken by collectors, and encouraged this as probably the most productive means of directly bringing objects back to the tribes. The third session, “STOP Act: Legislation, Operation, Potential Outcomes” brought the legal expertise of Gregory Smith from Hobbs Straus Dean & Walker, LLP and Kate Fitz Gibbon from Fitz Gibbon Law, LLC as well as Dallin Maybee’s experience as a lawyer and as a businessman operating SWAIA. The panelists discussed the STOP act’s goals and intent, operation and implementation through federal agencies and potential outcome as well as raising some alternative approaches to the bill. Greg Smith, an attorney representing Acoma in drafting the STOP Act, as well as many other tribes on a variety of issues, discussed the history of the STOP Act with respect to an Acoma ceremonial shield that was offered for sale at auction in Paris. Smith said that the sale highlighted a need for a federal export law of Native American sacred and ceremonial art in order to leverage the return of the shield. He noted the passage of a joint resolution in Congress last year: “Protection of the Right of Tribes to stop the Export of Cultural and Traditional Patrimony Resolution.” However, a resolution does not have the force of law. Smith stated that the draft of the STOP Act introduced in the last congress included provisions to create an export ban on objects working with the existing definitions within other antiquities laws including NAGPRA, ARPA, and the 1906 Antiquities Act. ATADA’s attorney Kate Fitz Gibbon said that the goal of the symposium was to find pathways for better understanding and to facilitate the return of sacred objects to the tribes. She began by briefly stating the new rules adopted by ATADA in its Bylaws prohibiting sale of current, important sacred objects by ATADA members. Fitz Gibbon recommended that ATADA and the tribes work together and follow the path of such non-legislative solutions, as the most efficient, rapid, and effective means of bringing the largest number of sacred objects back to tribal communities. SWAIA’s CEO Dallin Maybee rounded out the conversation by discussing examples of SWAIA’s guidelines that help to regulate sacred and ceremonial items from coming to Indian Market and emphasized that all concerned should come together to work toward a solution. Mr. Maybee felt that concerns about infringement of due process rights were exaggerated as enforcement would not be broad. He also discussed how SWAIA and Indian Market handled situations in which a tribe was concerned that an artist’s work was too close to sacred or ceremonial objects and described a few, rare situations in which items were removed from the show by a tribe, without a challenge by the artist. The fifth session, “Building Bridges: Cooperative Initiatives”, brought to the table Robert Gallegos, ATADA Founding Board member and past President, Shannon Keller O’Laughlin from the Choctaw Nation, and Robert Alan Hershey from the University of Arizona. Robert Gallegos called on the the art trade to step beyond the requirements of the law to create a new paradigm of cooperation and voluntary returns in order to build a respectful relationship between the tribal community and the art collecting community. Gallegos said that all of us are responsible for a system that has allowed removal of sacred objects from the Native communities. The tribal communities themselves do not have a written law or code that prohibits removal, and the US government has actually encouraged removal up until NAGPRA was written, as earlier prohibitions did not protect tribal community interests and were instead directed toward preserving archaeological sites for scientific research. The history of the government interaction with the tribes was one of eliminating Indian populations, forcing acculturation and stealing their land. The US government defined the laws under which items were legally collected. He said the least the government could do was to provide adequate funding now to financially support tribal cultural heritage offices and to morally support efforts to bring back important objects to the tribes. He said that the market also has to realize its potential for harm. The market provides incentives for important cultural items to leave tribal communities. It is the market’s challenge to limit itself to exclude sacred objects from trade so that this system is rectified. Certainly, art dealers and collectors have a vested interest in the cultural property debate; people have invested very much in their collections. But the goal of the market should not be to retrench against all change, but to ensure that art dealers and collectors are treated fairly under the law. This partnership that ATADA is proposing is based on the idea that all people have the right to self-determination. It is therefore appropriate to defer to tribal elders for identification of sacred objects and accept that certain items should never have left the community. To better define ATADA’s position, he said that ATADA does not support an extension of NAGPRA to private collections, but it does support return of the key sacred objects. Gallegos stressed ATADA’s commitment to facilitating voluntary returns, which have so far involved the return of items that were lawfully purchased but are essential to the well-being of the tribes. He said that while he understood that everything in Pueblo religious life is important, but there are degrees of important. He felt that both sides will need to compromise. Gallegos said that since this information is privileged, it is unrealistic to expect tribes to provide ATADA with a list of sacred items. Without other direction from the tribes, ATADA has returned items generally regarded as sacred. So far, ATADA has facilitated the return of Zuni war gods, Acoma and Laguna flat and cylinder dolls, Hopi ‘friends’, and Navajo masks. Items generally regarded as sacred include altars and altar elements, and items from shrines belonging to the community. 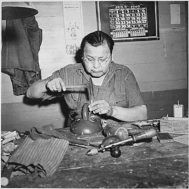 ATADA does not regard items made for commercial or individual use by Native American artisans as sacred, or communal, regardless of age. He concluded by saying that we should not rely on the government; every federal agency has its own agenda. We should instead focus on working in good faith with the tribal leaders. Shannon Keller O’Loughlin stated that she intended to raise uncomfortable questions and began her discussion by defining what was art and what was not art. Among her propositions was that one way of defining art is material that is not signed. She felt that regardless whether it was legal or not, it is not legitimate to trade is anything taken from the land from underground that could be called an antiquity. She did not separate out finds of archaeological items from private property which may legally be dug in the US with the consent of the owner. She felt that even though laws are restricted in time and geography, these items should not be marketed. She expressed admiration for “brilliant” laws from many other countries that define any item from underground as national property, asserting that an excavated item without archaeological context is worthless. She felt that there was an opportunity through the Cultural Property Implementation Act to expand the role of the State Department to establish a reciprocal agreement that would keep US artifacts from entering other countries. Professor Robert Hershey felt that it was not enough to talk about “cultural property.” He dismissed all arguments that dealers and collectors could legitimately see collecting and the trade as “honoring” Native culture or that there was true value in appreciating it under non-Native, Western concepts of what art is. The archival model and anthropological model should likewise be rejected. Regardless of how challenging it is to suggest that books and research regarding the tribal communities should be destroyed, this was a legitimate alternative perspective that ought to be recognized as meaningful to tribal communities and a means of protecting their rights in privileged information. Ethical perspectives and attitudes about Native Americans also needed to change in fundamental ways so that not only tangible objects were treated as cultural property, but intangible cultural property also received full recognition. Until Native American perspectives became the lens through which outsiders saw laws pertaining to Native property, there would not be a legitimate framework for addressing Native concerns. Dr. Hershey has been developing a framework for culturally respectful and tribal-community based laws and regulations involving cultural property, which will be published in the near future. The Symposium ended with a question and answer period followed by closing statements from the panelists. The conference was presented by ATADA and SAR and made possible, in part, by the generous support of TCI Wealth Advisors, Inc. and Heritage Auctions. Images; Jenny Hughes (Pomo, Native American). Girl’s Coiled Dowry or Puberty Basket (kol-chu or ti-ri-bu-ku), late 19th century. Willow, sedge root, bulrush root, acorn woodpecker scalp feather, California valley quail topknot feather,oilivella biplicata shell, cotton string, 7 x 14 1/2 x 14 1/2 in. (17.8 x 36.8 x 36.8 cm). Brooklyn Museum, Museum Expedition 1907, Museum Collection Fund, 07.467.8308, Brooklyn Museum; Anasazi (Native American). 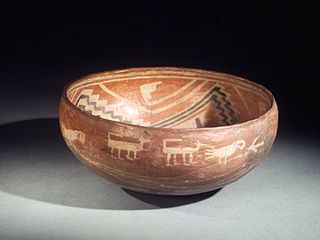 Fourmile Polychrome Bowl, 1350-1400 C.E. Ceramic, slip, 4 1/2 x 9 7/16 x 9 7/16 in. (11.4 x 24.0 x 24.0 cm). Brooklyn Museum, Riggs Pueblo Pottery Fund, 02.257.2562, Brooklyn Museum; Pomo (Native American). Doctor’s Headdress (guk-tsu-shua), 1906-1907. Crow feather, redbud or dogwood, wood, cotton string, Indian hemp, 25 x 39 x 29 in. (63.5 x 99.1 x 73.7 cm). Brooklyn Museum, Museum Expedition 1908, Museum Collection Fund, 08.491.8952, Brooklyn Museum; Blackfoot (Native American). Headdress Case, late 19th century. Rawhide, pigment, 17 1/2in. (44.5cm). Brooklyn Museum, Henry L. Batterman Fund and the Frank Sherman Benson Fund, 50.67.30, Brooklyn Museum; Sisseton, Sioux (Native American). Inlaid Pipe Bowl with Two Faces, early 19th century. Catlinite (pipestone), lead, 3 x 5 x 3 in. (7.6 x 12.7 x 7.6 cm). Brooklyn Museum, Henry L. Batterman Fund and the Frank Sherman Benson Fund, 50.67.104, Brooklyn Museum.